“As the 7th OVC camps in front of the Chester courthouse, one has to think of 155 years ago another 16 year old soldier looked up at the Chester Courthouse and wondered if or when he would see home again,” reads the photo caption on the 7th Ohio Volunteer Cavalry Facebook page about this image. 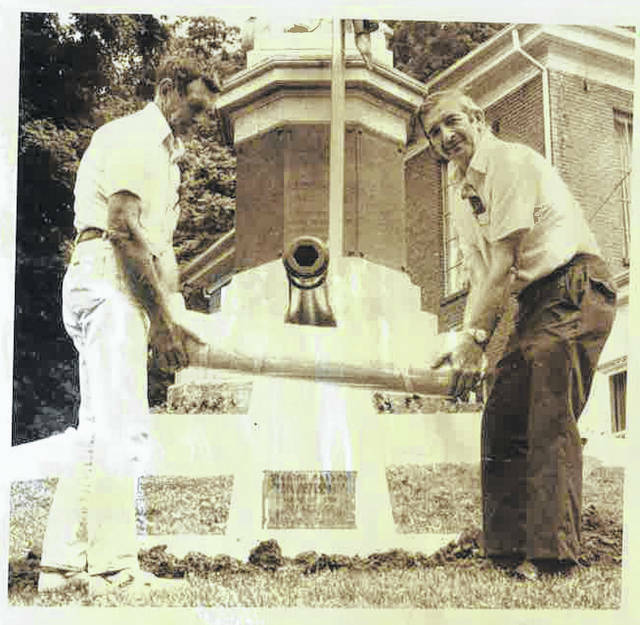 Roy Holter and Leland Parker place the time capsule during the 175th anniversary of Meigs County in 1994. 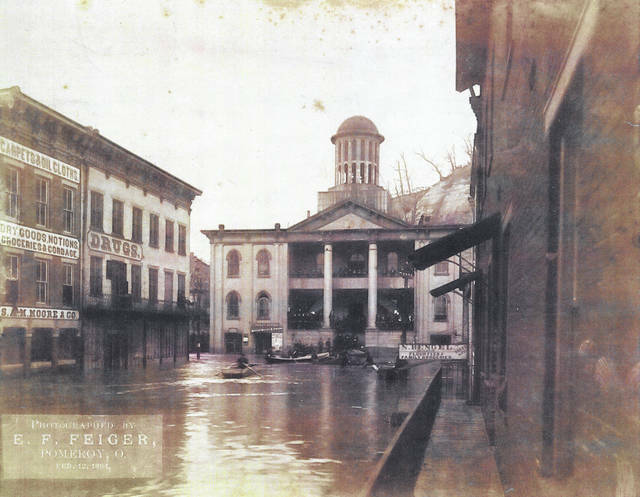 The Meigs County Courthouse is pictured in this 1884 photo by E. F. Feiger. The Chester Courthouse and Academy are now home to a museum and the Chester Shade Historical Association. 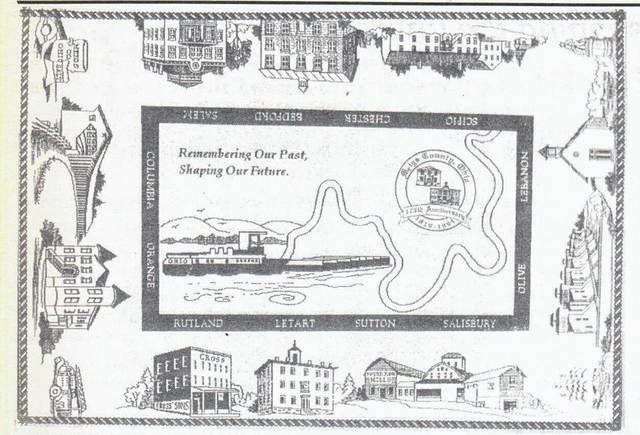 This commemorative coverlet was designed for the 175th anniversary of Meigs County in 1994. The cotton heirloom coverlet depicted the history of Meigs County and featured the logo and theme of the observance. Built in 1890, the Grandstand at the Meigs County Fairgrounds is an unusual structure that has been built to match the curve in the racetrack. Designed as a half-moon on the first turn in the mid-1880s by Lore Davis, it is the only structure of its type at a fairground in the state of Ohio and is listed on the National Registry of Historic Places. 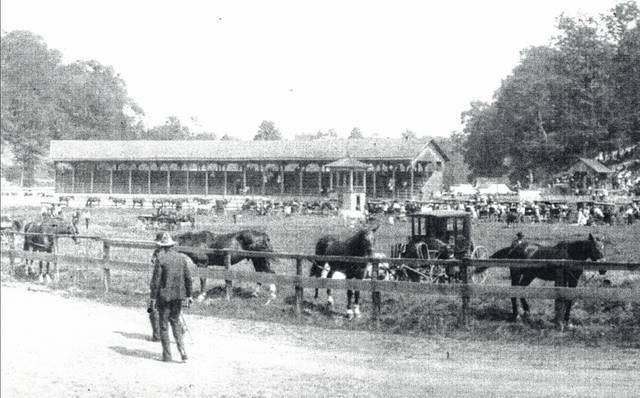 The undated photo shows activities at the Grandstand during the fair. MEIGS COUNTY — It’s a celebration 200 years in the making. This year marks Meigs County’s 200th birthday and the celebrations and events will begin this week and continue throughout the calendar year. Formed in 1819 from portions of Gallia and Athens counties, Meigs County was named in honor of former governor Return Jonathan Meigs Jr.
On Jan. 21, 1819, the Ohio government authorized the creation of Meigs County. It was a few months later in April 1819, that the first county government meeting was held, according to journal entries kept at the commissioner office. The County’s first Courthouse, which still stands today, was constructed in 1823 in Chester. The courthouse served as the seat of county government until 1840. By June 1841, the county seat had been moved to Pomeroy, in a building where Trinity Church is now located on Lynn Street. The current courthouse opened in 1850, and is unique in that it has ground floor entrance on all three levels. Several events and celebrations are being planned for 2019 to commemorate the anniversary, the first of which will be held on Monday, Jan. 21, coincidentally, the day the county was founded. Each month the Bicentennial Committee will be unveiling a Bicentennial Historical Marker to recognize a historic place or event. One maker will be placed in each of the county’s 12 townships, the first being in Salisbury Township. 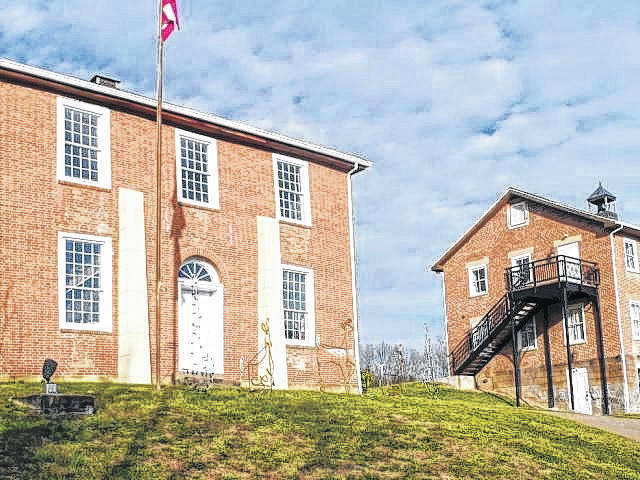 At 10 a.m. on Monday, a ceremony will take place in Pomeroy at Water Works Park (the park near the Pomeroy/Minersville line) to mark the “Kerrs Run Colored School” which was nearby. The school was in operation in the late 1800’s and early 1900’s and still stands on Kerrs Run. After the first marker is placed, each subsequent marker will be unveiled on the third Wednesday of each month. Locations will be announced in The Daily Sentinel prior to each month’s event as not all located have been selected at this time. The main Bicentennial Celebration will take place April 26-28 with a series of events. As part of that event, Meigs County Civil War Days will take place at the Meigs County Fairgrounds, hosted by the 7th Ohio Volunteer Cavalry. 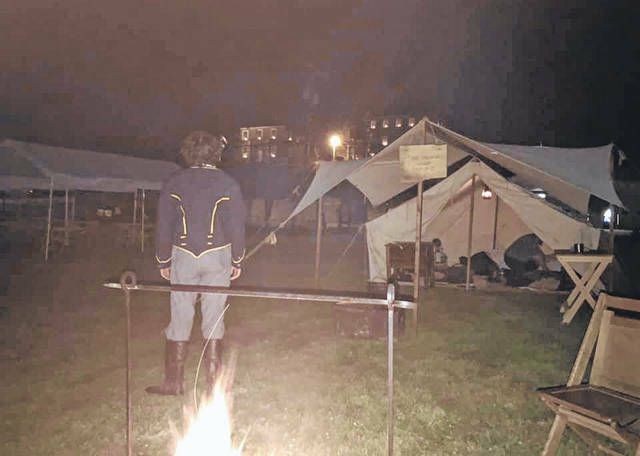 The event will begin on Friday, April 26 with area students coming to the fairgrounds to see a battle, demonstrations and other activities, as well as learn about some of the county’s history. Later on Friday evening will be the annual Chester Shade Historical Association Banquet which will follow the bicentennial theme. On Saturday, a parade is being planned for 10 a.m. in Pomeroy and possibly Middleport. Following the parade, a time capsule, which was buried as part of the 175th anniversary celebration in 1994, will be dug up and opened with a new time capsule to be buried. This event will take place near the Civil War Monument at the Meigs County Courthouse. Throughout the remainder of Saturday, vendors will be set up in town and entertainment will take place. Reenactors will also be taking part in the day’s events, with the details of a possible battle still being worked out. On Saturday evening a Civil War Ball is being planned at Wolfe Mountain Entertainment, with more details to be announced later. The weekend’s events will conclude on Sunday, April 28, with a reenactment to be held at the Fairgrounds. Currently there are around 100 reenactors registered to take part. While the main logo for the bicentennial has been released, five additional logos are planned for the year to represent different eras and locations in the county. The second logo is expected to be released in March. In addition to the events, commemorative lapel pins are available with the Bicentennial Logo. Pins with the first logo are currently available in the Meigs County Clerk of Courts Office, Syracuse Village Hall and other locations. Pins for the other logos will be available at different times throughout the year. Other merchandise will also be available throughout the year with proceeds to benefit the Meigs County Bicentennial Ambassador scholarships. For more on the Bicentennial and to stay up to date on events taking place visit the Meigs County Bicentennial on Facebook.